At 20 GHz bandwidth the PicoScope 9300 sampling oscilloscopes address digital and telecommunications applications of 10 Gb/s and higher, microwave applications up to 20 GHz and timing applications with a resolution down to 64 fs. Optional 11.3 Gb/s clock recovery, optical-to-electrical converter or differential, deskewable time domain reflectometry sources (40 ps/200 mV or 60 ps/6 V) complete a powerful, small-footprint and cost-effective measurement package. The PicoScope 9200 and 9300 Series are leading-edge product families resulting from the same long and continuing program of product development. The PicoScope 9300 Series shares many features with the 9200 Series but has updated hardware and software. In this comparison of the two families we will go beyond the headline specifications to consider which model is suited to your application. The discussion includes the recently introduced PicoSource PG900 fast pulse generators, which use the same fast pulse technology found in the 9300 Series sampling oscilloscopes. Leaving aside parameter specifications for a moment, you first need to decide on the hardware configuration—the combination of input and output channels—that best suits your requirements. As shown in Figure 1, the range of models that we offer is extensive. The 12 GHz PicoScope 9200 Series and the 25 GHz PicoScope 9300 Series are both available with and without TDR/TDT sources, optical-to-electrical converters and clock recovery capability. The PicoSource PG900 Series is available with built-in 60 ps outputs, external 40 ps outputs or both together. The bandwidth of your oscilloscope must be large enough for the signal speed or bandwidth (related to its frequency, data rate or transition time). Higher-bandwidth instruments also have faster triggers, shorter sampling interval (time resolution) and lower timing jitter. These parameters may determine your choice of oscilloscope family. Microwave bands covered I, G, P, L, S, C, X. I, G, P, L, S, C, X, K.
A peculiarity of sampling oscilloscopes is that trigger bandwidth rarely matches channel or sampler bandwidth. To facilitate stable trigger (and hence waveform display) from very high signal frequencies, all PicoScope 9200 and 9300 sampling oscilloscopes feature a separate prescaled trigger input. Here the trigger rate is divided down to a rate that the sampling oscilloscope can accept. This is sufficient on a sampling oscilloscope as a repetitive signal and trigger are required anyway. You should therefore always consider prescaler bandwidth when selecting a product family, noting that a further externally divided or subharmonic trigger signal will be required to view a stable waveform at higher frequencies than those listed in the table above. Figure 3 - Faster serial data clock recovery with the PicoScope 9300. Left: PicoScope 9200 Series. Right: PicoScope 9300 Series. When working with data streams, the data clock is often not available. This is particularly common when working with serial data from an optical fiber, but also with many high-speed electrical data-only streams where clock recovery is used to eliminate clock-to-data skew or accumulated jitter. It is therefore usual to find a clock-recovered trigger capability provided with broadband oscilloscopes, and in the PicoScope 9000 Series this is offered on the models below. Figure 4 – Faster sampling and better sensitivity on PicoScope 9300. Left: PicoScope 9200 – 10 ps/div, 2 mV/div (200 fs and 40 µV resolution). Right: PicoScope 9300 – 5 ps/div, 1 mV/div (64 fs and 40 µ resolution). A sampling oscilloscope does not have the switched voltage ranges seen on a real-time oscilloscope. Instead it has a single fixed voltage range and a high-resolution analog-to-digital converter (16-bit in the PicoScope 9200 and 9300 Series). Full-scale range is ±1 V DC or AC peak. The converted signal is digitally scaled to achieve all other voltage ranges. Note that even at ±4 mV (1 mV/div), 8 ADC bits remain available. A sampling oscilloscope (in its sequential sampling mode) gathers only one trace sample for each trigger event. It is therefore essential that it triggers, stores and rearms as fast as possible. In this respect the 9200 Series is typical amongst sampling oscilloscopes, while the PicoScope 9300 Series with its ARM processor and SPARTAN-6 FPGA stands out as one of the fastest available. Traces, eyes, graded persistence displays, measurements and statistical assessments are all as fast as they come on the 9300 Series! Thanks to the faster sampling in the PicoScope 9300 Series, trace length can realistically be increased to an industry-leading 32k samples. This improves view and zoom detail, measurement resolution and resolution of mathematical functions such as FFT, and more closely matches the available vertical and horizontal resolutions. Additionally, both series can take full advantage of a connected HD display size and resolution and can even stretch this waveform and persisted display detail (16 bits and 32k samples) across multiple monitors. A sampling oscilloscope has no input amplification. Despite this, noise is still present in the system and limits the smallest signals that are viewable. The PicoScope 9300 Series front end is quieter than the 9200 Series but has greater bandwidth. In practice, the minimum viewable signal level is similar at similar degrees of averaging. However, the faster PicoScope 9300 Series can average more deeply while achieving a similar update rate. The bandwidth of the optical-to-electrical converter (and any trigger or clock recovery pick-off applied) limits the bandwidth and data rate of any optically derived signal, as can be seen in the table below. Maximum clock recovery rate, pattern sync and trigger rate and their pick-off bandwidths may also need to be considered. A further consideration is that optical-to-electrical receivers (and their transmitter counterparts) tend to distort the data eye, mainly because of their asymmetric transition times. Receivers, including the PicoScope 9000 Series sampling oscilloscopes, are provided with electrical lowpass filters to correct the eye at particular data rates. Typically these have a –3 dB cut-off of 0.75 x data rate, and oscilloscope bandwidth needs to be higher, about equal to the data rate. Please contact Pico Technology technical support if a particular data rate does not appear to be covered by the accessory filters listed for these products. You should also check that the optical-to-electrical converter, common to the 9200 and 9300 Series, is compatible with the fiber mode and connector (single-mode, multimode, FC/PC), peak power +7 dBm and carrier wavelength of the application to be addressed. The wavelength ranges are 750 nm to 1650 nm, spot calibrated at 850 nm (MM), 1310 nm (MM/SM), 1550 nm (SM). Figure 5 – More detail and differential TDR/TDT with the PicoScope 9300. Left: PicoScope 9200 – 250 mm 50 Ω and 75 Ω, coax cable TDR. Right: PicoScope 9300 – 500 mm 90 Ω SATA cable, differential TDR. Time domain transmission and reflectometry both apply a fast-edge pulse to an unknown single or multi-port network. This could be an electrical component, a cable, or a signal receive or transmit port. By measuring the pulse that reflects back (TDR) or the pulse that passes through (TDT), the transmission characteristic or mismatch can be analyzed. Frequency domain or time domain? Scalar or vector network analyzers perform a similar function to TDR/TDT analyzers but use a frequency-domain instead of a time-domain technique. These instruments inject and measure a sine wave, one frequency at a time. TDR/TDT instruments inject a fast pulse containing a wide spectrum of frequencies all at once. TDR/TDT analysis tends to be faster, while scalar or vector analysis tends to have more dynamic range. Results, for essentially the same measurement, can be converted between the two domains. Time-domain measurements are particularly effective at determining the physical location of a mismatch, fault or component. Physical distance is obtained simply by multiplying the timing of a reflection by its propagation velocity (close to the speed of light, c). Vector quantities such as s-parameters can theoretically be extracted from both techniques, but presently the PicoScope 9200 and 9300 Series extract only scalar quantities. System bandwidth or, more accurately, system transition time (that of the fast pulse, combined with that of the sampling oscilloscope and any interconnect) determines the time resolution and hence the physical distance that can be resolved. To resolve the magnitude of a mismatch, a complete rise time and fall time are needed to cleanly define a pulse amplitude. When detecting the presence or location of a mismatch, distance resolution can be around five times better than this. Resolution quantities given below assume typical PCB or coax propagation velocity of around 0.7 c.
Available pulse amplitude and variability of pulse amplitude can both be considerations, but not as significant as you might think. Usable pulse amplitude is limited in practice to the peak full-scale voltage that the oscilloscope can accept: in these instruments, 1 V pk from an open-circuit reflection or unimpeded transmission path. The benefit of large amplitude at the source (as with the PicoScope 9311) is that the test system source match can be improved when using an attenuator. Variable amplitude gives the opportunity to optimize signal level and thus dynamic range in any TDT/TDR measurement, and possibly reduce amplitude to keep within its device-under-test limits or, in the case of an active device, explore its nonlinearity. Pulse distortions or aberrations at the pulse source or at the receiving oscilloscope and interconnect are not of primary importance in a TDT/TDR application because they are corrected by system port calibration into known short, open and load. All the PicoScope TDR/TDT solutions include two generators and two receive input channels. Two TDR or TDT measurements can be performed simultaneously in each case. 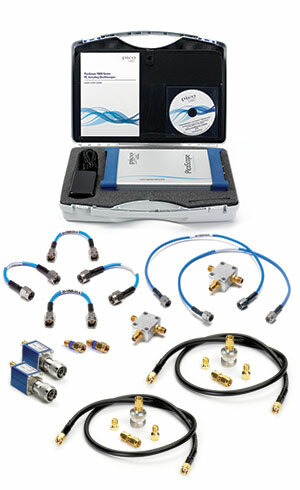 However, the PicoScope 9200 Series and PicoScope 9000 software are limited to single-ended measurements, while the PicoScope 9300 series and PicoSample 3 software can address true differential, single-ended and common-mode measurements for transmission lines or ports with or without a physical ground. A further benefit of the PicoScope 9300 series is the option of either variable and high-amplitude pulse generators, based upon step recovery diode technology, or slightly faster, but fixed and lower-amplitude generators, based on tunnel diode pulse heads. In general, the step recovery diode offers more flexibility. As a third configuration option, the TDR/TDT generator can be separated from the oscilloscope. There is a choice of three generators from the PicoSource PG900 family with either SRD or TD generation, or both. These offer the flexibility of separately located transmit and receive TDT as well as stand-alone use. The PicoSource PG900 Series generators are compatible with all models in the PicoScope 9300 series, allowing for instance the combination of TDR/TDT with optical, clock recovery or four-channel capability. TDR/TDT functionality is substantially enhanced in the PicoSample 3 software supplied with the PicoScope 9300 Series. As noted in the table above, differential TDR/TDT is supported, with full correction for differential coaxial (twinaxial) cable, and for parallel or twisted lines where no ground is present. The PicoScope 9200 and 9300 Series oscilloscopes are supplied with different software. PicoSample 3, supplied with the 9300 Series scopes, is a modern, graphically enhanced, wide-format and touchscreen-enabled evolution of its predecessor, the PicoScope 9000 software supplied with the PicoScope 9200 Series. User interface and key feature enhancements in PicoSample 3 are highlighted in the comparison below. You can download both applications and use them in demonstration mode to explore the differences. Innovative course, fine, defaults, slidebar, keyboard and calculator entry in a single control. Click, drag, enlarged controls and calculator entry. Full touchscreen operation. 9200 Series: 170 mm (W) x 255 mm (L) x 40 mm (H) (6.7 x 10.0 x 1.6 in), 1.1 kg (2.4 lb) max. 9300 Series: 170 mm (W) x 285 mm (L) x 40 mm (H) (6.7 x 11.2 x 1.6 in), 1.2 kg (2.6 lb) max.